Mark your calendars and stay tuned for more information coming soon! KOLBY KINDLE Tours: Sister Act (Curtis Jackson), Dreamgirls (Marty) Disney’s Beauty and the Beast (Cogsworth u/s). Regional: Music Theatre of Wichita, Lyric Theatre of Oklahoma, Westchester Broadway Theatre. Special thanks to family, friends, and CTG. BFA: Otterbein University. Join actor and book writer Adam LeBow and Grammy-nominated composer Tor Hyams for a day of master classes exploring the world of professional performance. Greenwood is an original musical currently being workshopped by members of GCPA's Youth Theatre Company, and we are thrilled to open to the public the opportunity to study with two of its creators. Congratulations! You got the part! Here's your script!” Now what??? This class with book writer Adam LeBow provides an introduction to the craft of Script Analysis. Students will learn how to approach a text and mine it for all the acting gold it can yield. Bring clarity and confidence to your work with scripts, from the brief excerpts we are often given for auditions ("sides") to entire full-length plays and films. Take advantage of this opportunity with Grammy-nominated composer Tor Hyams to learn exactly what casting directors and creative teams look for in auditions. Students may bring 2-3 memorized songs in any musical theatre style and will experience a casting call "audition." Tor will coach each student on their strengths and weaknesses and give guidance about type, vocal styling and musical genres, and performance and presentation. Teaching time will help students focus on aspects of their physicality, personality, and performance skills which work most in each individual's favor. or's honest feedback and industry experience will help students discern and grow in the areas in which they show the most potential for success in the performing industry. CLICK HERE for more information and to purchase tickets to the staged reading of Greenwood on Sunday, September 25th! Summer Production Season Broadway Workshops - June and July 2016! This summer, we will be joined by three guest teaching artists who will be offering exclusive talkbacks and teaching time with casts of our summer productions, as well as Master Classes open to the public. These guest artists have all performed or are currently performing on Broadway in the shows GCPA is doing this summer. We are so pleased to provide our students and actors and the greater St. Louis youth theatre community the opportunity to work with these industry professionals. Guest Artist and Master Class details below. CLICK HERE for a condensed list of Master Class details and Bundle information. Ben Jeffrey was raised in Kansas City, MO, and while he's lived many wonderful places since he left home, in his heart, he's always been a Midwestern boy. Ben caught the theater bug as a very young man, and he decided to succumb to the fatal disease, earning his BFA in Acting and Musical Theatre from Abilene Christian University in West Texas and a Masters in Acting from Rutgers University in New Jersey. Ben's cold, empty life as a bachelor came to an end when he met his beautiful wife, Christina. They married in 2009 and moved to New York City. Since then, Ben has had the privilege of performing on Broadway in Disney's The Lion King, where you can still see him play Pumbaa the Warthog, (a role he has performed over 2000 times! ), and Disney's Aladdin, where he has played Babkak, one of Aladdin's comrades in crime. He has also had roles on television, in Louie, The Good Wife, & Boardwalk Empire. Other favorite roles include Jane Eyre (Rochester), In the Sawtooths (Nellie), Seussical! (Horton), and Beauty And The Beast (Beast). In February of 2015, Ben & Christina welcomed their daughter Amelia into the world, and she continues to make everything around her better. CHECK OUT THIS VIDEO FROM BEN AND HIS FRIENDS IN NEW YORK ABOUT HIS WEEKEND WITH GCPA! Students will learn several fundamentals of hand to hand stage combat, with emphasis on situational awareness, communication, & safety. Moves including slaps, falls, and hair pulls will make this a fun foundation for actors of all levels. Ben Jeffrey will also participate in a talkback time with students, answering questions and providing information about his experience as a professional performer. Students will learn to harness the power of play & truth in all of their humorous glory! Ben will work individually with each student on a comedic song and monologue. He will also participate in a talkback time with students, answering questions and providing information about his experience as a professional performer. *There is still time to join the Aladdin KIDS casts and take advantage of the opportunity to work with Ben and perform with him in concert on June 10th! 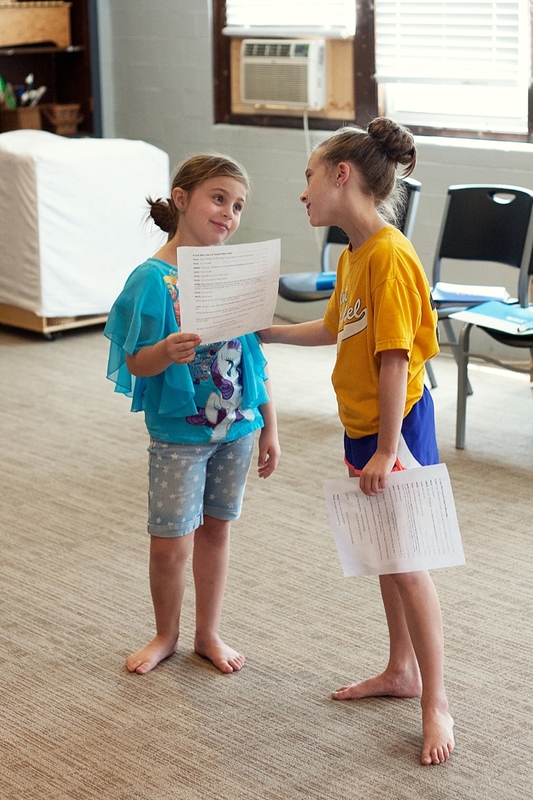 Enrollment is still open to actors Grades K-4 in both our June and July camps. CLICK HERE for details and registration information. Jared Gertner is best known for playing Elder Cunningham in The Book of Mormon on Broadway, in the 1st National tour, and in London, where he received an Olivier Nomination for Best Lead Actor in a Musical. He's also appeared on Broadway as William Barfee in The 25th Annual Putnam County Spelling Bee, as Warren in the Off-Broadway premiere of Ordinary Days (Roundabout Theatre Company), and in regional theatres across the country. In Los Angeles, Jared recently created the role of Al Dubin in the new musical, I Only Have Eyes For You, and the role of Sidowsky in the world premiere of the play, The Dodgers. Television credits include: Supernatural, How I Met Your Mother, Marvel's Agent Carter, Ugly Betty, The Good Wife, and the popular Broadway-themed web series, Submissions Only. Last year, Jared starred in a television pilot for NBC/Universal, and this year, he appeared in the CBS pilot, Superior Donuts. His voice can be heard as an adorable pug dog in the upcoming movie, Pupstars, as a bunch of folks on American Dad, and in radio and television commercials. He is a graduate of NYU's Tisch School of the Arts. In addition to his acting work, Jared has also been a theatre educator for the past 15 years. He has taught master classes and workshops all over the country and in London. He specializes in creating a safe and fun space for young artists to begin to explore process and technique. You can find more information at www.JaredGertner.com or on Twitter, @jaredgertner. This fun and funny class will include theatre games and improv exercises. Mr. Gertner will create a safe and playful space for the students to let down their guard and begin to explore theatre craft. Focus will be on using the space, thinking on your feet and working as a team. In this vocal performance master class, each student will have a chance to sing a song and be coached by Mr Gertner. He will tailor each student's time to his or her specific needs. Focus will be on story telling, emotional connection and vocal technique. Mr Gertner specializes in creating a safe and fun space where young artists can let down their guard and begin to explore technique. This class will also include a Q and A session where students will be able to ask Mr. Gertner about his life, training and career. Nancy Johnston was Mrs. Claus in Elf on Broadway for its three year run. (She also understudied the role of Emily, and yes, got to go on.) She appeared as Hold Me, Touch Me in the First National Tour of The Producers for over two years, opening in L.A. at the Pantages Theater with Jason Alexander and Martin Short. Other Broadway credits include The Secret Garden and The Music Man. Off-Broadway: Jessica Gatewood in the World Premier of Splendora, Merrily We Roll Along, Olympus on my Mind (featured on the cast recording) White Lies, Nunsense and ENCORES first season’s Allegro. Regional theatre favorites: Chloe in Lips Together Teeth Apart at Capitol Rep in Austin, Texas (Best Actress, Critics Table Award), Julia in Lend Me a Tenor at Paper Mill Theater and Bay Street Theatre; Florence Foster Jenkins twice in Souvenir in Vermont and Houston; Big Edie/Little Edie in Grey Gardens at Houston Stages and just recently covering the role at Bay Street Theater starring Betty Buckley. Nancy is excited to return to St. Louis where she appeared as the Baker’s Wife in Into The Woods at St. Louis Repertory Theater. She has taught Acting I at NYU in the Vocal Performance Program and Cap 21. She is a co-founder of Brick Town Theater in Beacon, N.Y. where she resides with her husband, Jess. There is so much more to a song than the music! Treating songs as monologues and stories to be told, Nancy will help students develop individual pieces - moving through space, exploring and expanding, and taking the audience and the storyteller to places no one expects! Nancy will also provide time for students to ask questions about her performing career and experience. THE MORE YOU TAKE, THE MORE YOU get! Can't decide which class to take? You don't have to! Bundles cannot be processed online. Auditions don't have to be intimidating! Join GCPA in an exclusive extension of our trademark Audition Intensives, with special guest artists ready to help you prepare with confidence and rock your auditions from start to finish. This intensive weekend features classes, break-out sessions, and individualized instruction crafted by some of St. Louis' most renowned performers and arts educators. These masters of the business bring a wealth of expertise and experience sure to take your auditioning to the next level. With specialities including perfecting a dance call, acting through the song, and college audition techniques, this weekend will provide opportunities for performers of all kinds to grow and gain the necessary tools for success. BEN NORDSTROM (Acting) is an award-winning theatre artist based in St. Louis, MO. As an actor and singer, he has appeared in over 50 plays and musicals at major theatres around the country and in New York City. Since relocating to St. Louis with his family, Ben has become a well-known presence within the local theatre community. He has worked with the Muny, Repertory Theatre of St. Louis, Arrow Rock Lyceum Theatre, Stages, New Jewish Theatre, Variety StL, Mustard Seed, HotCity, OnSite, and Echo. He has received a St. Louis Theatre Circle Award, two Kevin Kline Awards, and was recently named St. Louis' "Most Versatile Actor" by the Post-Dispatch. Currently, he is the emcee for the annual St. Louis Teen Talent Competition at the Fabulous Fox Theatre and has emceed major events for the St. Louis Arts and Education Gala and St. Louis Children's Hospital. Ben is a member of Actors' Equity Association and Screen Actors Guild-American Federation of Television & Radio Artists. He holds a BFA in Musical Theatre from the Conservatory of Theatre Arts at Webster University. www.BenNordstrom.com. MARTY FOX (Voice) is native of Bremen, IN (right near nowhere), but moved to St. Louis with his wife, Stephanie Fox, in 2010. Prior to that, he was a successful actor, music director and vocal coach, working in and out of New York City for nearly a decade. He attended Simpson College, a small liberal arts school in Indianola, IA, where he received a Bachelor's degree in Vocal Performance and Piano Performance. He has coached singers and actors from LA to NYC. Since moving to St. Louis, Marty has had the privilege of working with a number of local theatre companies - Insight Theatre, Stray Dog, The Rep, and New Jewish Theatre to name a few - in performance, music direction, and accompaniment. Some of his favorite roles and shows include The Fantasticks (El Gallo), 1776 (John Adams), West Side Story (Tony), Falsettos (Whizzer), Guys and Dolls (Sky Masterson), As Bees In Honey Drown (Evan Wyler), Throughly Modern Millie (Jimmy Smith), and Sweeney Todd (Tobias Ragg). Marty is also the Principle Accompanist for Gateway Mens' Chorus (www.gmcstl.org), another local 501(c)3 organization. RON GIBBS (Dance) is a native St. Louisan who spent 16 years as a Broadway musical theatre performer. He assisted Tony Award winning director/choreographer Susan Stroman for 7 years. Ron moved "home" in 2002 to manage the musical theatre organization STAGES ST. LOUIS, which he did with great success for 11 years. Now he loves working as the Development Director for the Leigh Gerdine College of Fine Arts at Webster University, where he manages individual, major, and planned giving. Ron has worked with such legendary performers as Mickey Rooney, the lovely Eartha Kitt, the fierce Elaine Stritch and the irrepressible Carol Channing. CLICK HERE TO REGISTER FOR JUNIORS. *Required for students new to GCPA's Audition Intensives. CLICK HERE TO REGISTER FOR FULL DAY. CLICK HERE TO REGISTER FOR COLLEGE PREPARATION SESSION. Space is VERY limited! Reserve your spot today! Questions? Contact Ashleigh Blevins, Education Director at education@gcpastl.org. Looking for one on one audition prep? Check out our Repertoire and Technique Sessions, available all year long! In this session new students will learn one song cut for an audition, including sheet music and recorded track preparation. Students with songs already chosen can brush up their technique and vocal skills, freeing them to delve deeply into song interpretation and expression. Whether you just need a jump start or you’re looking for advanced vocal coaching, our instructors will help you with foundational technique and preparation so you’re ready to go! CLICK HERE to register for a Vocal Technique Session. Not sure where to start in choosing a song or just looking to spice up your current selections? Let GCPA help you find the right songs to showcase your skills and style! At the end of this session you will leave with at least two different audition cuts in contrasting styles and genres. Our instructors will help you select and prepare both sheet music and recorded tracks on a CD so you are ready to walk out of the session and straight into your next audition! CLICK HERE to register for a Vocal Repertoire Session. Monologue selection and preparation can be challenging, but this session will give you the tools and confidence to choose, cut, prepare, and present an impressive piece which highlights your acting strengths. You will leave with at least two contrasting one-minute monologues and a solid foundation in preparation and presentation. You will be well on your way to making an impact in the audition room and beyond! CLICK HERE to register for a Monologue Coaching Session. Jennifer has been seen on Broadway in WEST SIDE STORY (Rosalia), WOMEN ON THE VERGE OF A NERVOUS BREAKDOWN (Cristina), GHOST (Mrs. Santiago), and SPIDERMAN: TURN OFF THE DARK. She has also appeared Off-Broadway as Miss California in LITTLE MISS SUNSHINE and as Cheryl in GETTING MY ACT TOGETHER. She is currently playing Micaela in a workshop based on the Bizet opera CARMEN. She can be heard on many cast albums and is currently working on her debut album. Jennifer is originally from Albuquerque, New Mexico, and an alumna of Oklahoma City University.